A grist mill is a grain mill that turns whole berries of grain or whole kernels of corn into meal or flour. At Kenyon's Grist Mill, we still grind in our vintage, 1886 grist mill and continue to use the original granite millstones quarried from Westerly, Rhode Island. These huge stones produce the exceptional texture and quality not found in modern, steel ground flours. Genuine, single pass stone grinding also preserves the vital, natural nutrition of the grains. Kenyon’s offers the ingredients that health conscious consumers are searching for - ground the simple, old-fashioned way of long ago. We produce a variety of wholesome pancakes mixes, corn muffin mix, bread mixes, and other meals and flours. We are best known for our Johnny Cake Meal and Clam Cake Mix. If you find yourself wondering what a Johnny Cake is, click here for more information. Scroll down for video footage of the mill on Martha Stewart and Food Finds. Kenyon's Grist Mill was also just recently aired on the Travel Channel's “Bizarre Foods: Delicious Destinations, Providence” with Andrew Zimmern. You can watch the entire episode here (headphones recommended). 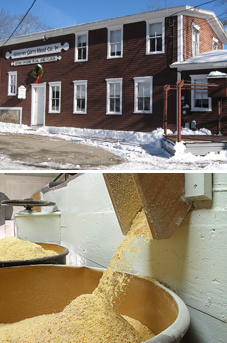 Kenyon’s Grist Mill is the oldest manufacturing business in Rhode Island, dating back to 1696. It is the second oldest continuously operating business in the state, just behind the White Horse Tavern in Newport. We are regularly inspected by the Rhode Island Department of Health and the FDA, which qualifies us to ship throughout the country and stand behind our products' excellence. Customers have sought Kenyon's products for generations because of our honesty, dependability, and high standards. We take pride in doing business the right way and feel honored to be preserving a piece of Rhode Island's history. Kenyon's Grist Mill is always looking for new sources of locally grown grain, especially the very rare crop of Rhode Island Flint Corn. Although we try very hard to purchase our grains as local as possible, it is also important to consider the farming methods used. Our farmers source non-GMO seed and do no use pesticides. We do not use any additives or preservatives. Feel free to read about the difference between genuine stone ground products and steel ground products here. For more updates on what we are doing, make sure you follow us on facebook here. For a variety recipe ideas, click here. The village of Usquepaugh is a breathtakingly beautiful and historic location, along the Queen's River and waterfall. We are currently booking 2018 weddings, private and corporate events, team building and kayaking trips, and educational tours. If you are interested or have any questions, please feel free to contact us. This light, fresh scent will remind you of walking through a pine grove. It is like taking in a breeze from New England Pines. Hard milled and moisturizing, it will last in your soap dish without dissolving and leave your skin feeling soft. Made right here in Rhode Island, Lightfoot’s Pine Soap is produced by one of the oldest soap makers in the country! Kenyon’s Grist Mill is the premier national distributor for this natural product. It is so popular; we even offer this soap by the case to wholesalers, country clubs, hotels, and retail customers alike. To order retail, click here. For wholesale, call 800-7-KENYON. 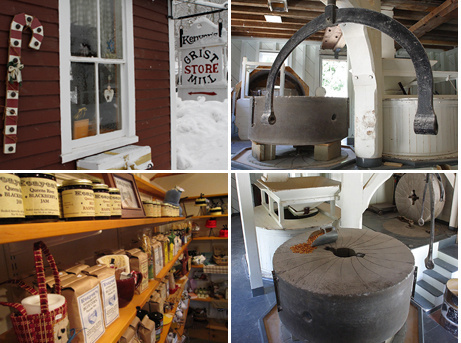 The videos below remind us of Paul Drumm Jr., who purchased Kenyon's Grist Mill in 1971. He was truly a caretaker of a Rhode Island tradition. His legacy lives on with us every day (June 9, 1930 - December 14, 2013).